2 Meeting with Firearm Licensing Branch personnel, 22nd November 2008. 3 The Tattler is back – with all the goss! New Year’s greetings to all… Hopefully everyone thoroughly enjoyed the Christmas festive season. And maybe the good boys and the good girls received some nice pressies. A new fusil may have been wishful thinking, but perhaps a pound or two of black powder wrapped in pretty paper came your way? I remain ever hopeful each December, but being good all year doesn’t come easy! To celebrate the New Year, Glen and Anthea kindly hosted a Saturday luncheon barbecue afternoon extending to very late evening. Their charming farm-style country home and blacksmith shop, surrounded by beautiful shady European trees and gardens, provided the perfect atmosphere for pilgrims to catch up with one another’s news in true festive season spirit. Some twenty members, family and good friends found plenty to talk about, and much laughter to share, amidst the rural background sounds of the rooster and hens, guinea fowl, sheep, and the cries of a solitary peacock. Thanks must go to all the ladies who prepared so much lovely food, and particular thanks to hosts Anthea and Glen for making the day possible, and so delightful for all. We all agreed with the concept of a public display back at our AGM in September. But our secretary had computer break-down problems delaying official approvals. Full credits however to the MMFAT organisers, and to Firearms Licensing Branch, we were able to attend under authority, as the desirable Populous Place Permit arrived just in the nick of time, allowing carriage and display of our flintlock rifles. Assisting Bob at his covered-wagon tentage display were Jim, Paul and Chook, all dressed in appropriate period costumes, and answering many questions from the public over the weekend. Other Trappers attending the event in civvies were Lisa, Nathaniel, Nicholas, Richard and Lorraine, while Jeff and Katherine were there in their handsome Viking disguise. It is quite hoped that we will be invited to re-attend in November 2009, and this kind of exposure can only benefit the group in re-enacting circles, while publicity must enhance long term recruitment possibilities from the large audiences attracted. Meeting with Firearm Licensing Branch personnel, 22nd November 2008. We received an invite to attend an important meeting of Re-enactment groups with Licensing Branch. Jenny Baker of the B&G, liaising with Stephen Foster, DFO Dandenong had arranged for Re-enactors to hear Dennis Tocock from Licensing speak and clarify regulations on firearms and controlled weapons, swords, etc. and discuss how these laws impact upon us shooter re-enactors. Reps from more than 26 historical re-enactment clubs enjoyed the discussion, and had opportunity to question Dennis on their group’s particular concerns. Three members of our Committee attended – Ian, Jim and Chook, and we fielded a number of queries felt pertinent to our events. We were well pleased with the answers and explanations. Some very minor changes to our future programs will be adopted. The Tattler is back – with all the goss! Hearty congratulations to Katherine & Jeff on arrival of their beautiful baby girl – Elizabeth Jennifer Clarke b. 17/11/08 – an 8lb treasure with dark hair and blue eyes. Q. Who was that Trapper observed at MMFAT wearing the cleanest, newest, brighter than glow-mocs, buckskins ever seen this side of the Wind River? A. Pretty-boy Bob! Tattler copped several whinges after the September Rondyvoo – due to strange lights observed about the camps after dark. No, not the Aurora Australis! Kerosene is in the future. Kerosene lanterns with candle inserts look just like kerosene lanterns, and are as those LED battery torches / pseudo lanterns – as out of place as a fart in a chapel! Candle lanterns are period, they provide sufficient light, look great and work just fine. Then your editor was chastised for displaying a plastic rat on our website. But, you would have to admit that the rat’s Trapper apparel and camp set-up was impeccable. Yeah, yeah, I know, plastic is plastic is plastic – Kid’s toys should also be authentic! June 2009 – SSAA National Rendezvous, Millmerran, Queensland. November 28th & 29th Time Line Camp, at Campbelltown Tasmania. Some Trappers are already planning to extend this camp to a “long hunt” holiday, spending extra days touring the Apple Isle. Brother Ted was there recently and sent this lovely post card after reading about Coops shot tower in Around the Traps vol.13. Why not add a visit to this historic tower to your list of “must see and do” whilst adventuring down south? No “Range Fees” at our Rendezvous: Any competitive challenge shoots may be at a “mark” or at game animal wood cut-outs. Any hunting that may be approved on our host farm properties will be for suppression of pest animals only. We don’t conduct shoots at printed paper targets with scoring rings, and we do not charge “Range fees”. Touchholes can vary from the simple hole drilled through the wall of the barrel to the sophisticated coned and gold lined touchhole as developed in the peak of flintlock technology – a’ la the famous English gunsmith – Joseph Manton. The basic touchhole is a hole of approximately 1/16” diameter, drilled at 90 degrees through the wall of the barrel (Fig.1). This simple method was very effective and common on firearms of the flintlock era. I have seen touchholes drilled at 45 degrees to the barrel and from 1/32” to 1/8” diameter. The oversize diameter holes lose too much pressure, thus velocity and power, whilst the smaller ones are prone to clog up, giving no result other than the proverbial “flash-in-the-pan”. Our own Murray will testify to this phenomenon! Those touchholes drilled at angles are thus longer and so can cause slow ignition. I have fired some of this ilk that have a definite delay between the pan flash and the main charge igniting, resulting in the familiar whoosh-bang effect that tends to destroy accuracy through flinching. Vast improvements can be achieved by coning the barrel wall on the inside, so that the charge is closer to the lock’s pan. This common method of the old timers was achieved by using a small hand operated gear-driven countersink drill inserted into the breech end of the barrel, and slowly coning the inner wall of the flash-hole (Fig.2). Modern manufacturers and gunsmiths achieve the same by inserting a coned liner into the touchhole. A larger hole is drilled in the barrel and tapped to the required thread, a liner is then screwed in (Fig.3), and the screw head of the liner is filed or cut off flush with the barrel’s external wall. One method that I have used on my firearms is to install a ¼” UNF stainless steel grubscrew as a liner. The barrel is tapped with a tapered thread and the prepared grubscrew screwed into the barrel. A 1/16” hole is drilled in the centre of the screw and bingo – a stainless steel coned touchhole liner. The screw can be inserted with the hexagonal cavity facing out to the lock, or inwards to the bore; it doesn’t seem to make any difference to ignition times, and I have used both methods (see Fig.4). Besides providing more efficient ignition, vent liners also allow easier replacement when the touchhole has become enlarged by the escaping hot gasses over continuous use and time. This may not be so apparent to the casual shooter of infrequent shots. The stainless liner slows down that wear process that the old-timer gunsmiths combated by using gold or platinum lined touchholes. Burning gunpowder is very abrasive and corrosive and will cut a small touchhole out in a carbon steel barrel. This wear can sometimes be noticed on the edge of the pan of well used locks! Good ignition also requires careful positioning of the touchhole in relation to the pan and to the breech of the gun. Most flintlock shooters know that for best ignition the touchhole should be in the centre and level with the top of the pan. Further improvement can be obtained by correct positioning of the touchhole in the gun’s breech. Too far forward can slow ignition time noticeably, and it is advised to centre the vent just forward, no more than a 1/8”, of the breech plug face and centre in the barrel. Coning and polishing the face of the breech plug, and/or grinding an ignition chamber/channel there can achieve additional ignition efficiency (Fig.5). These methods require some thought and design work, and are usually only possible when the gun is built, as position of the breech plug, barrel and lock all determined the ultimate positioning. In conclusion, the touchhole plays a major part in ignition speed and reliability, so it pays to install the best touchhole one can, as reliable and fast ignition makes shooting flintlocks a pleasure that cannot be matched by the new-fangled percussion caplocks! Further to our article on shot towers, Ted also forwarded this height chart for our interest. 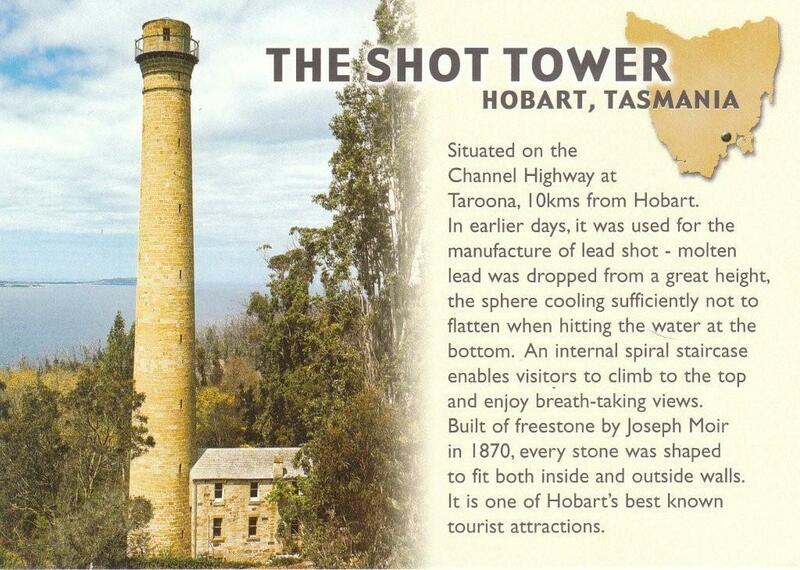 Of sad note is the lack of any mention of Melbourne’s very first shot tower, built by Louis Hamel in Sackville Street Collingwood in 1878, and since demolished – a reminder of how easily the records and our heritage can be forever lost!